This lithograph was taken from plate 11 of 'Afghaunistan' by Lieutenant James Rattray. During the severe winters, Afghanis wore a shirt (kameez)under a leathern spencer or half-jacket, which was embroidered in silk and had a wool lining. Thick black cloth trousers, fastened by a rope around the waist and bound with the same material from ankle to knee, were also worn. Amulets, relics and little bags full of texts and prayers were tacked about their clothes. This Burj (watch-tower) was one of many between the Maidan and Arghani valleys. The British met with considerable resistance at such points on their advance from Kandahar to Kabul. The resisting Afghans were spread along mountain posts and were commanded by two nephews of Dost Mohammed. 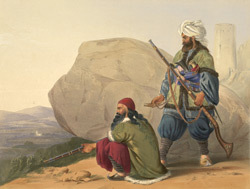 The men depicted here belonged to a British regiment called the Rangers, which was raised in Kohistan under the command of Lieutenant Maule of the Artillery, who said that he had his hands full trying to impose discipline among these "wild, unruly, merry fellows". Rattray himself left Kohistan in September 1841, but Maule, his subaltern and European sergeants were murdered by their troops only two months later.